The Samyang 85mm f1.4 IF MC Lens is a fast, prime lens with a maximum f1.4 aperture and is ideal for portraits, travel photography and night shots. The lens features multi-layered, anti-reflective coatings, which add to the very high level of light transmission and the iris diaphragm enables you to produce aesthetic bokeh. Construction is made up of 9 elements in 7 optical groups, including one aspherical lens to ensure exceptional image quality. 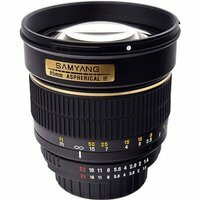 The Samyang 85mm IF (Internal Focusing) lens features anti-reflective coating that is designed to reduce reflection. Internal Focusing (IF) means that all focusing occurs within the lens, i.e. the lens will not change size as it zooms. This manual focus (no autofocus) lens has a minimum focus distance of 1.0m, weighs 513g and measures 78 x 72.2mm.